Study Medical Photos: Kawasaki's disease And Its Management. 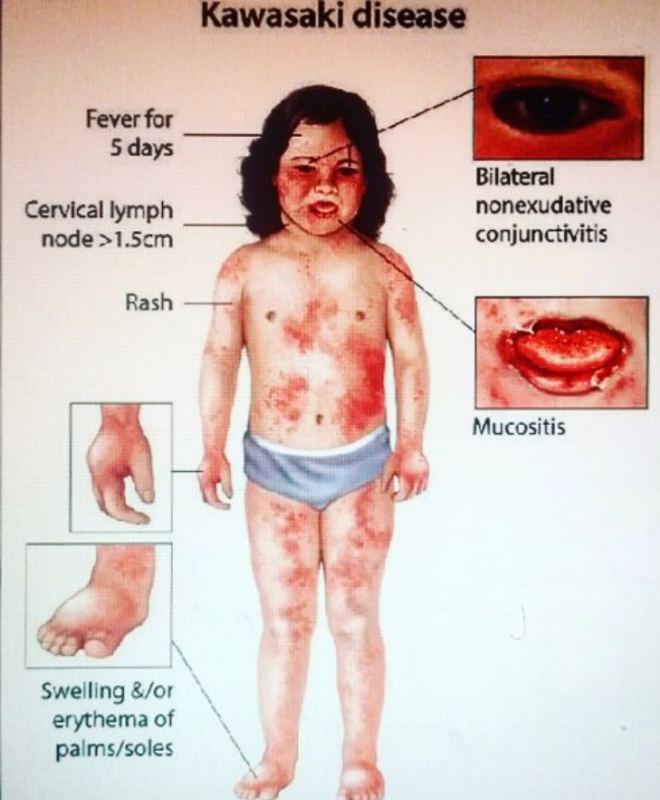 A 6-year-old female presents with 6 days of fever. On physical examination, she has a temperature of 102°F, a heart rate of 120 beats per minute, conjunctival erythema, an indistinct maculopapular rash, digital desquamation, pharyngeal erythema, and cervical lymphadenopathy. A rapid strep screen and throat culture are negative. The next step in evaluating and treating this patient includes which of the following? Discussion: Kawasaki's disease is the most common cause of acquired heart disease in children in the United States. Diagnosis is based on clinical findings and this disease should be suspected in children who have a fever for 5 days or longer. Laboratory findings consistent with Kawasaki's disease include elevated white blood cell count, sedimentation rate, and C-reactive protein. The primary concern with Kawasaki's is prevention and detection of cardiac complications, which develop in more than 50% of patients. - Myocarditis occurs most commonly—in up to one-half of patients. - myocardial infarction develop in an additional 20% of patients. Prompt therapy with intravenous immunoglobulin and aspirin lessen the risk for developing these cardiac complications.